Factory Direct WA specialises in quality patios, garden sheds, workshop sheds, garages, pool sheds, and room additions. Factory Direct is a Western Australian family owned business and is made up of people with a combined industry experience well in excess of 100 years. Our products are attractive, strong, sturdy and reliable. We specialise in quality patios, garden sheds, workshop sheds, pool sheds, garages, commercial storage buildings and home additions. At Factory Direct we also build shelters to house the caravan, boat or motor home or can add a granny flat or outdoor room to cater for your growing family. Our structures can even be used as commercial sheds to provide the extra storage space you need for plant, equipment and stock. Choose from COLORBOND®, ZINCALUME® or Weathertex®, with a wide range of roof designs including gable, flat, federation, dome, pyramid, hip and combination. Our huge selection of designs and sizes means we have a product to suit everyone’s style and budget. Factory Direct WA owns and operates its own factory and assembly plant in the Perth metropolitan area, located in Cockburn Central. This well-equipped modern complex enables us to efficiently produce high quality products and deliver to our clients on time, every time. It’s quality you can trust, manufactured to Australian Standards for your peace of mind and backed by a business that’s committed to maintaining its reputation for excellence and value. If quality and price are your priorities then Factory Direct WA is your solution. Call into any one of our conveniently located display centres to discuss your needs and get expert advice from our knowledgeable team. 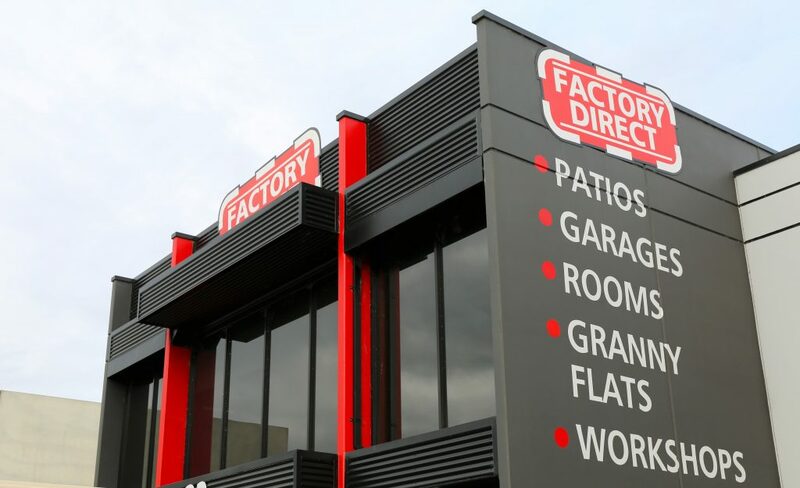 Factory Direct Pty Ltd trades as Factory Direct under builder’s registration number 11985.